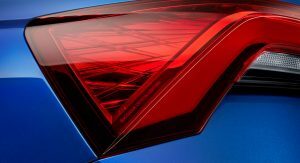 The teasing days are over as Skoda has finally lifted the veils of its all-new Scala, a vehicle that embodies the Czech brand’s ambitions. The Scala is not just an indirect replacement for the Rapid Spaceback, it’s also Skoda’s first real shot at the highly-competitive C-segment. 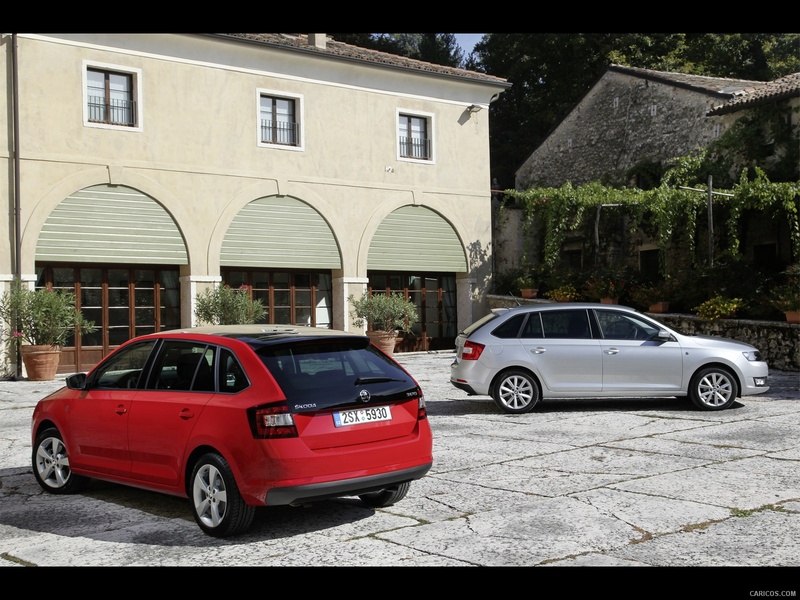 We’re talking about a car that’s almost as big the VW Golf. 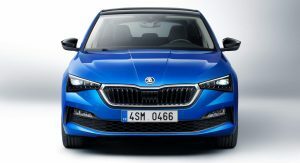 It’s 4,362 mm (171.7 in) long and 1,793 mm wide (70.6 in), making it a little shorter and narrower than the German compact segment benchmark. 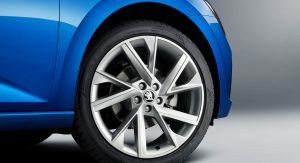 However, it rides on a longer wheelbase of 2,649 mm (104.3 in) and is a little taller at 1,471 mm (56 in). 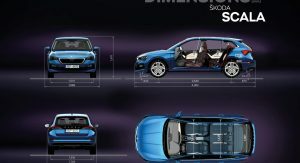 That results in similar interior dimensions to the larger Skoda Octavia, including one of the biggest luggage compartments in the segment. 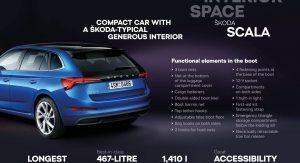 The Scala’s cargo capacity is 467 liters (16.5 cu ft) with all seats in place and 1,410 liters (50 cu ft) with the rear seats folded down. As the first Skoda model based on VW Group’s MQB A0 platform, the Scala completely repositions the brand in the compact segment. 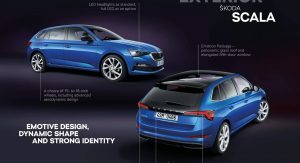 It’s also the first model to showcase the next development stage of the brand’s design language. 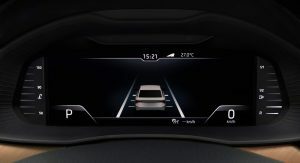 The new styling direction will be rolled out on future models as well. 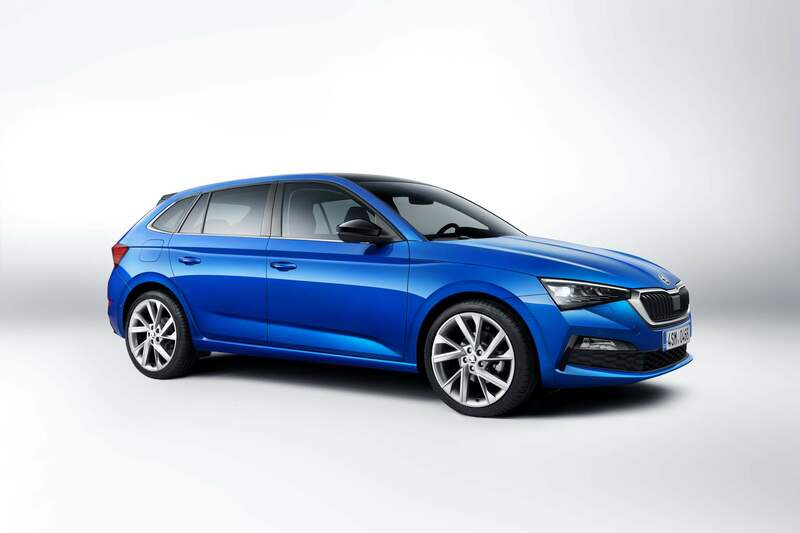 Previewed by the Vision RS study earlier this year, the Skoda Scala visually bridges the gap between a traditional five-door hatchback and a wagon — much like the Audi A3 Sportback. 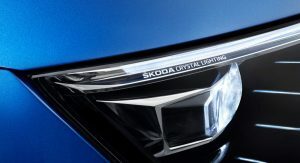 Highlights include the triangular partial LED headlights (standard), sizable third lateral windows, and the extended rear screen that blends with the wraparound LED taillights with dynamic turn indicators (optional). 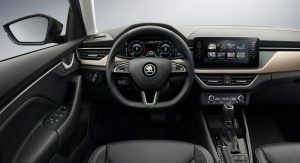 The interior adopts a fresh approach as well thanks to a sleek dashboard dominated by a freestanding touchscreen display available in sizes ranging from 6.5 inches to 9.2 inches. 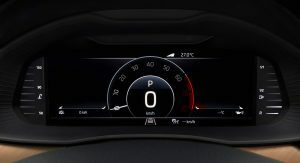 There’s also a 10.25-inch Virtual Cockpit available which works with the third generation of the MIB modular infotainment matrix. 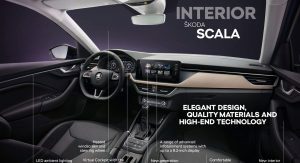 Interestingly, the infotainment system software or maps can be updated over the air via Skoda Connect mobile online services, since the SCALA is always online thanks to a built-in eSIM with an LTE connection. 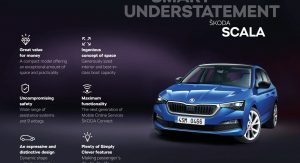 Skoda Connect also allows users to lock and unlock the car via a mobile phone. 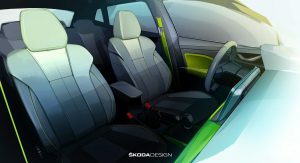 The cabin brings a new concept with soft materials, including a soft-foam surface with a texture resembling crystalline structures that covers the dashboard and optional microfiber Suedia upholstery. 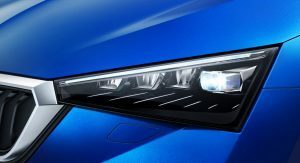 It also offers LED ambient lighting — albeit with only two available colors. 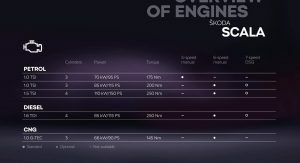 At launch, the Scala will offer five turbocharged engine variants, ranging from 90 PS (89 hp) to 150 PS (148 hp). 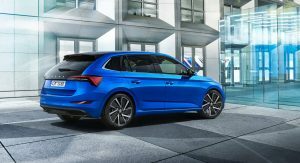 There are three gasoline units: an entry-level 1.0-liter TSI three-cylinder producing 95 PS (94 hp), a mid-range 1.0-liter TSI with 115 PS (113 hp) and a top-of-the-line 1.5-liter TSI four-cylinder that makes 150 PS (148 hp). The lineup also includes a 1.6-liter TDI four-cylinder turbodiesel rated at 115 PS (113 hp) and 250 Nm (184 lb-ft) of torque. Finally, customers can choose a 90PS (89hp) 1.0-liter G-Tec unit that runs on natural gas (CNG). 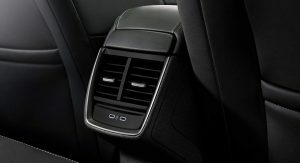 Transmission options include five- and six-speed manual and seven-speed dual-clutch units. 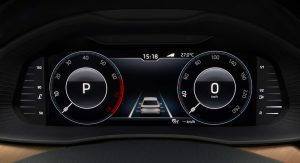 The Sport Chassis Control with Normal or Sport driving modes is optional. 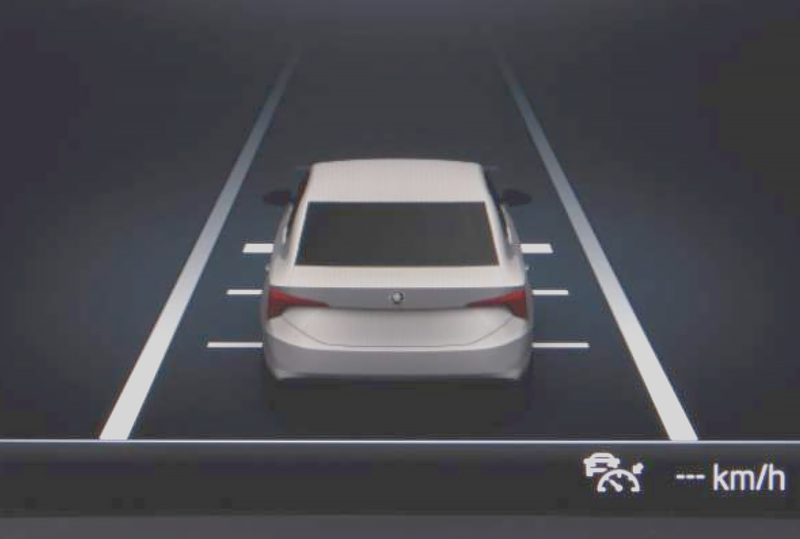 Safety-wise, the Scala offers standard Lane Assist and Front Assist with City Emergency Brake systems. 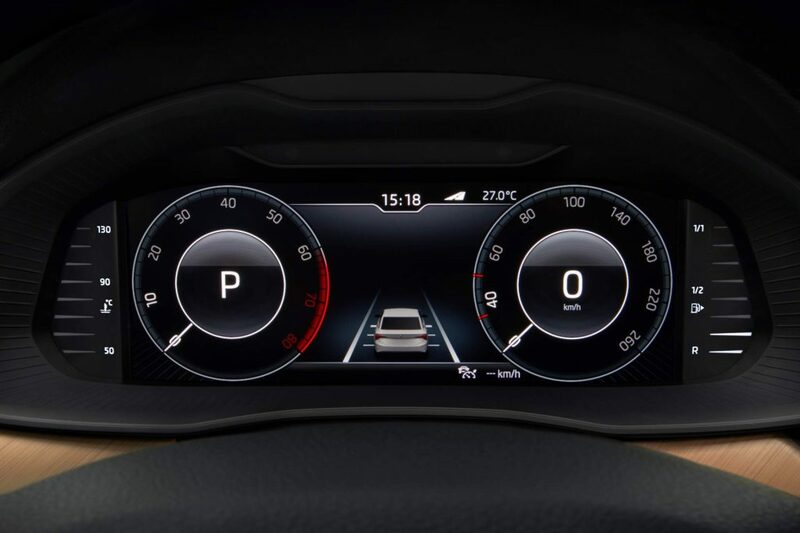 Available driving assistance tech includes the Side Assist function, Adaptive Cruise Control, and Park Assist. 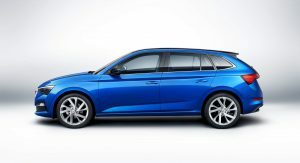 As for the proverbial “Simply Clever” features, the new compact hatchback brings an electric tailgate with “Tip-To-Close” function and a retractable tow bar. 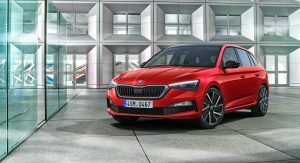 The all-new Skoda Scala will arrive in European dealerships in the first half of 2019. 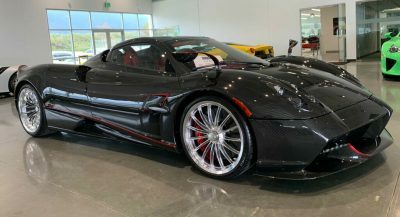 The interior and the back of the cars looks awesome. 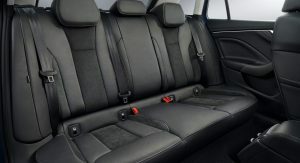 It looks also very spacious. The front and the headlights are fine I guess. 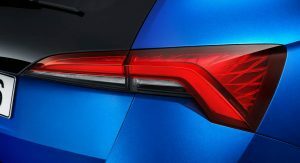 The back end looks like a Ford Focus. 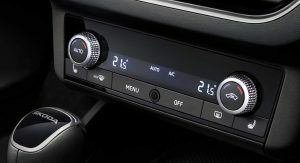 Seriously Skoda/VW, have you not learned from EVERY automaker that has replaced the volume knob with touch-capacitive buttons? Buyers want volume knobs! Ugh. 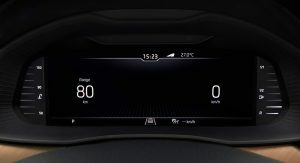 They are there as wheels on the steering wheel. I don’t miss them on the radio. I’m glad that the heater controls are real though. 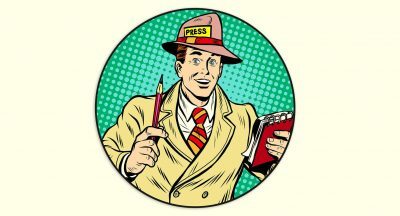 Others, namely passengers, will. 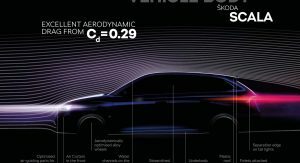 There’s a reason the substitute on the steering wheel wasn’t enough and why every other automaker has backtracked from this approach. 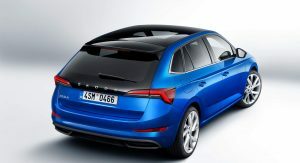 There’s an awful lot of Audi A3 in the side profile. In that blue the front end could almost be mistaken for a BMW. 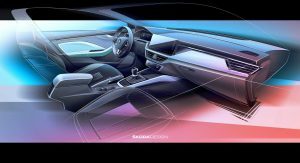 It kinda has this Vision C Concept vibe, but the details doesn’t really match up. 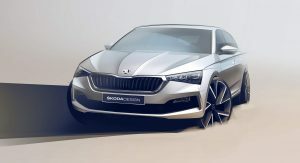 Official spoiler/teaser for the next Octavia/other new sedan or what? I simply can’t imagine that it isn’t intentional. 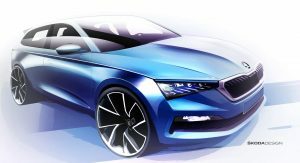 Could be a Scala sedan to replace the Rapid sedan basing on a Jetta platform? Not great but a vast improvement on the hideous Rapid. Should sell a whole lot better too! Finally USB-C plugs in cars, yes!!! 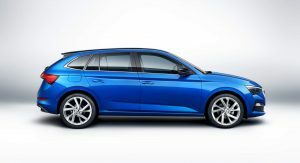 Looks like a short stationwagon. 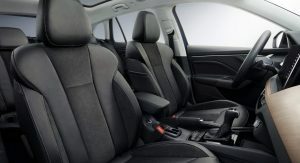 But oh my goodness, this interior is so much cooler than the Golf’s one. 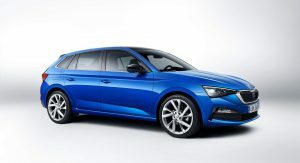 Is this supposed to replace the Fabia?. 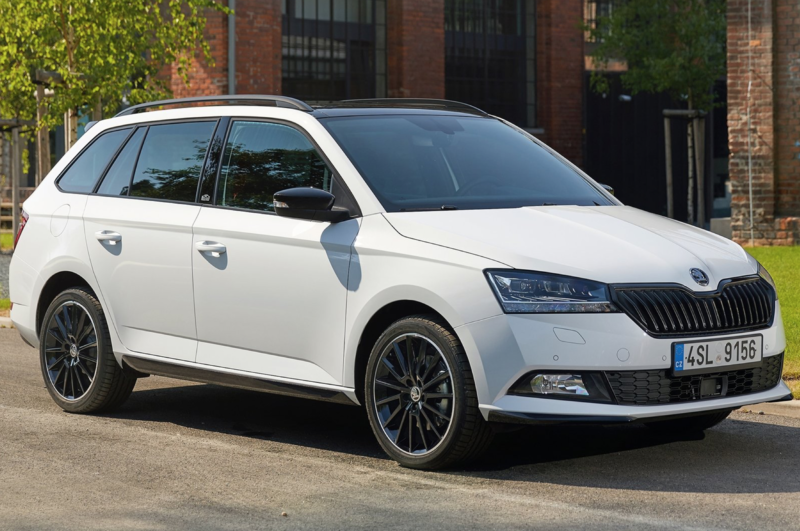 You know, I don’t currently live in a market where you can buy one of these, but… this looks an awful lot like the 2019 Fabia (shown below). Either way it’s an improvement,.. I like it. 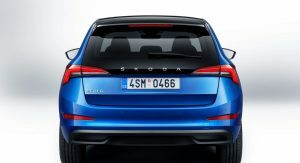 The use of a rear quarter window on the door with another one directly behind looks a little clumsy, but that aside, it’s a fairly inoffensive looking car with sharp front and rear ends. 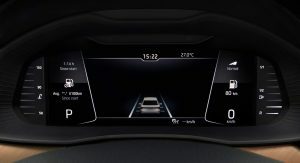 I do wonder how good basic models that do without the LED headlights, fancy pulsing indicators and extended, darkened glass on the hatch are going to look. If the Rapid Spaceback is any indication, the answer is not that good. Sorry, but this looks EXACTLY like a Focus. 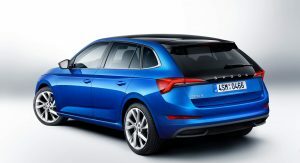 It’s funny how both the new Focus and the Scala look very much like the Fiat Tipo. 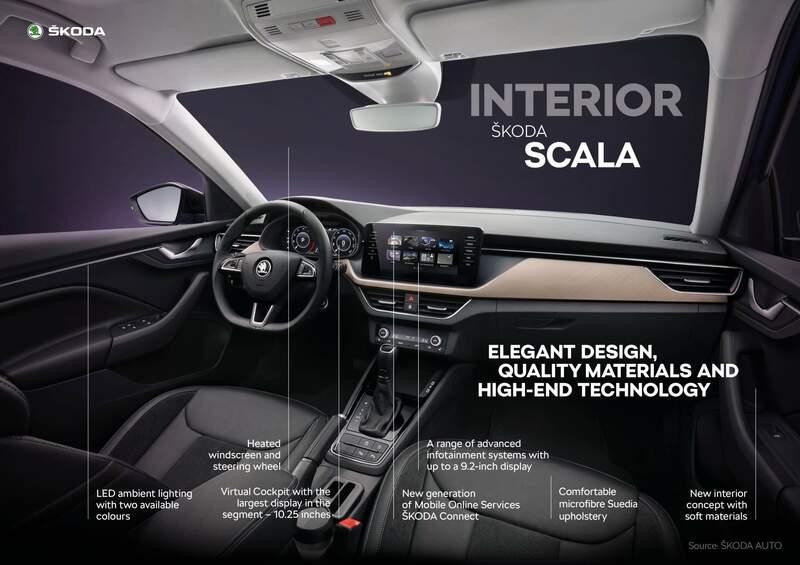 Scala is definitely the best looking one, but I’d like to see it in one of the lower trim levels. 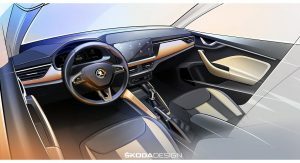 I was thinking just the same the other day – was in italy where there are lot of neat-looking higher-spec Tipo’s around. I’d argue the Tipo is a better looking vehicle than the latest Focus. This Scala is… handsome and refined, if not exactly beautiful. 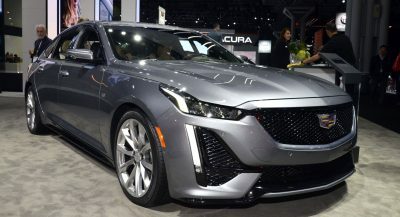 Hope it does well, and indeed, I’d also like to see it in a lower trim to get a better feel for it. 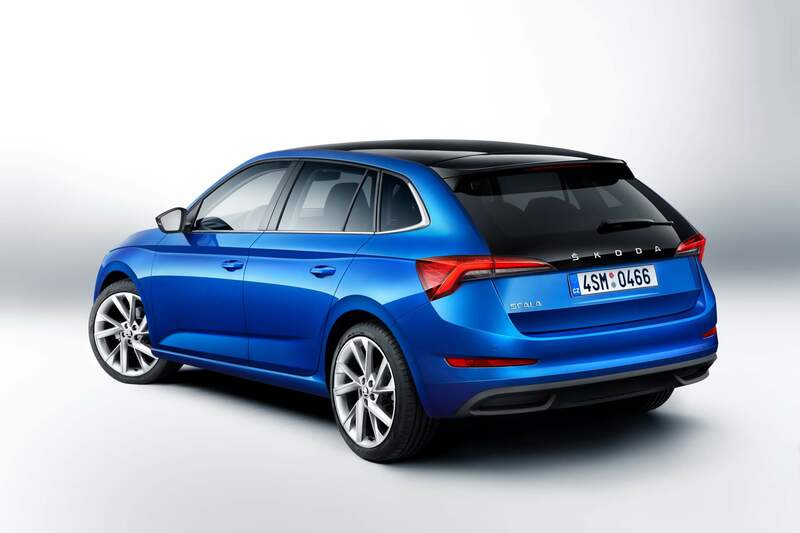 Definitely shades of Focus and Tipo, but even V40 and the newest BMWs at the back. 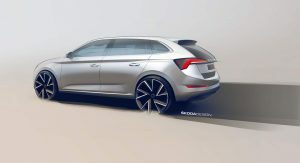 None of these are terrible references to have, and it has the typical sense of VW flair to its refinement. I think it’ll do pretty well. I think it looks great. 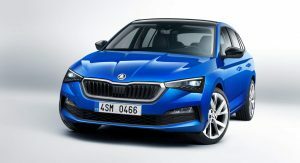 It follows the Skoda design language we’ve come to either appreciate or despise. Either way, I think it’s pretty nice. The interior is gorgeous. 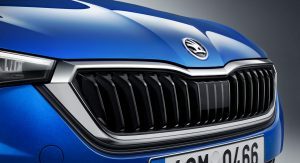 Previous PostPrevious Dipstick Spotted On New BMW M850i Engine, Is It Making A Comeback?